Being an orientation leader gives you a tight-knit group of co-workers and friends. This comes as no surprise, as you naturally get super close with everyone throughout spring training, on the summer retreat, during summer programs, living in the residence halls together, and finally, during On Iowa! week when you lead first-year and transfer students in their last few welcome events. Throughout spring training, you’ll develop and enhance professional skills, such as public speaking, group facilitation, written and verbal communication, assertiveness, and problem-solving. On top of that, you’ll work with your unique strengths and learn to effectively utilize and grow them. These transferable skills will come in handy no matter what profession you pursue after graduation. Free swag: an orientation polo, backpack, and name tag! Plus, you’ll still have about a month of summer to do whatever you want in-between summer orientation programs and On Iowa! Need we say more? In our humble opinion, these are some of the best bosses you will ever get to work with! Seriously. 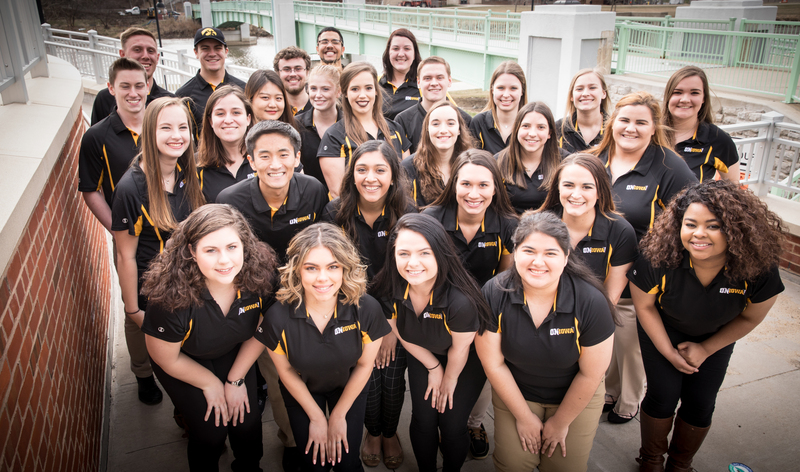 These amazing humans will support you, cheer you on, and act as great mentors that will help you get the most out of your Orientation Leader experience. 5. Make a HUGE impact! Serving as a role model and mentor to both On Iowa! leaders and the new incoming class, students will look up to you, and you have the chance to make a tremendously positive impact on the lives of others. So, what are you waiting for? Apply today for the greatest summer of your life!